The team at Union is excited to host you and your students at the Junior High clinic and concerts this year. • Please remind your students to bring pencils to all rehearsals. • This may sound too obvious, but please remind your students to bring their NBDA music folder. • All music stands will be provided; no need to bring folding stands. • 7th Graders will rehearse in the large band room (#1613, a.k.a. Band Room #1). Cases will remain in the classroom. Flute, Clarinet, Oboe, Alto Sax, and Trumpet Cases may remain under chairs; Bass Clarinet, Bassoon, Tenor Sax, Bari Sax, Horn, Trombone, Euphonium, and Tuba cases may be placed along the right and left perimeter of the rehearsal space. Cases are not allowed to be stored at the back or front of the room, to allow for ample space for the percussionists and for the conductor. • The 8th-9th Grade Concert Band will rehearse in the small band room (#1616, a.k.a. Band Room #2). Flute, Clarinet, Oboe, Alto Sax, and Trumpet Cases may remain under chairs; Bass Clarinet, Bassoon, Tenor Sax, Bari Sax, Horn, Trombone, Euphonium, and Tuba cases will remain in the hallway adjacent to the rehearsal room; signage will be provided. • The 8th-9th Grade Symphonic Band will rehearse on the UPAC Auditorium stage. Flute, Clarinet, Oboe, Alto Sax, and Trumpet Cases may remain under chairs; Bass Clarinet, Bassoon, Tenor Sax, Bari Sax, Horn, Trombone, Euphonium, and Tuba cases will be placed in the front two rows of the auditorium audience seating; signage will be provided. • Rehearsal spaces are likely to rotate on Saturday. We’ll let you and your students know with as much advance notice as possible. • Directors should lead their drivers to the bus loop on the east side of the campus, located off Mingo and clearly marked. Buses can drop students off under the large UNION HIGH SCHOOL sign. • Buses will then head south out of the bus loop and park in the lot southwest of the UMAC arena (just north of Sam’s Club). • Buses will return to the east bus loop via Mingo for picking up students. • Buses should never remain unattended while in the bus loop. • Personal vehicles should be parked in the south parking lot or in the northeast Visitors Lot (facing the Union Collegiate Academy). 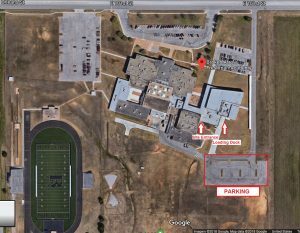 • For the Saturday concerts, parents & spectators will park in the Union High South Main Lot and enter the “South PAC / Gym” doors. 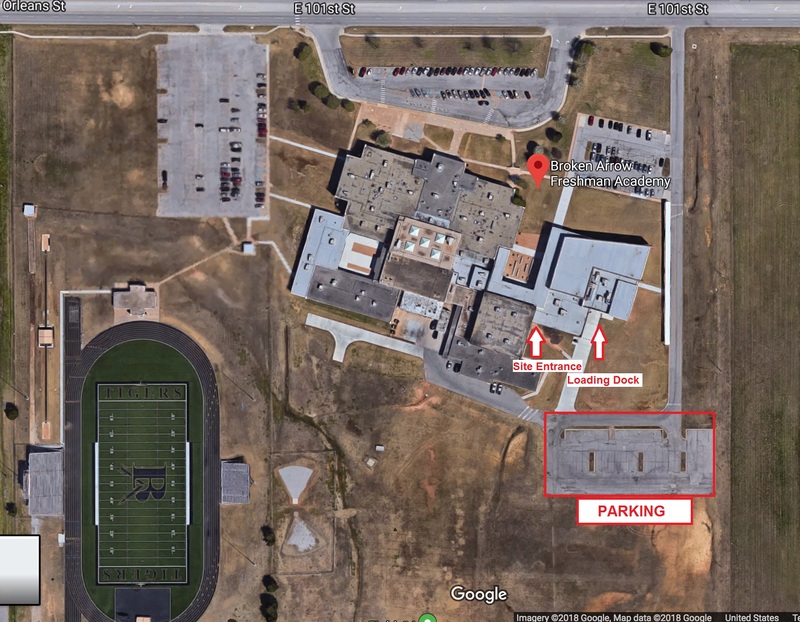 Red campus signs will direct campus visitors to this location; please pass along word to the parents of participating students that GPS/Google/Waze mapping is not likely to lead them to this parking lot, so they will need to follow campus signage. • Please note that vehicles of any type may NOT be parked in the bus loop at any time. • Under the UNION HIGH SCHOOL sign located on the bus loop is a set of glass doors that students and directors may enter. Once you have entered the building, take an immediate left to find the clinic rehearsal rooms. 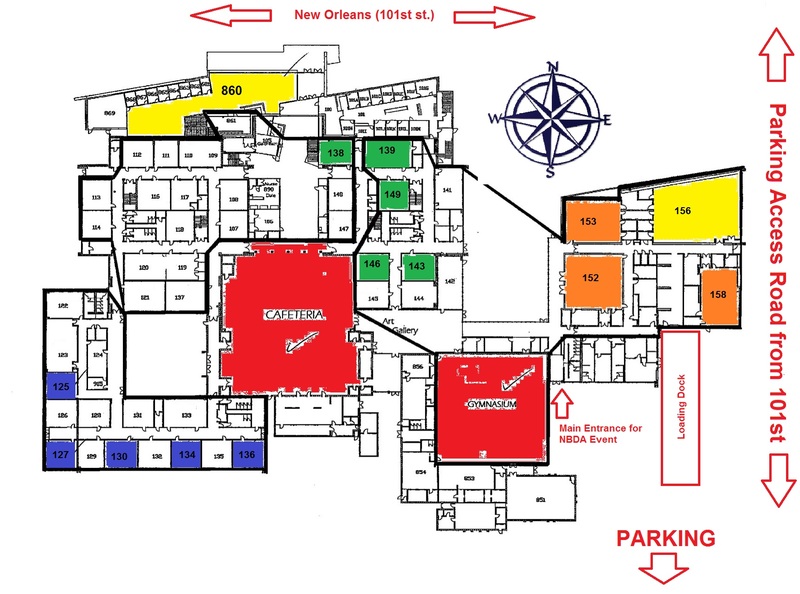 • If entering the building at any other time, please plan to do so by way of the Union H.S. South Entry (PAC / Gym)or the Union Collegiate Academy (northeast corner of the building); be prepared to present your ID. • Security is fairly tight on campus, and perimeter exterior doors are unlikely to be unlocked; please avoid propping doors for any reason. All percussion instruments will be provided. Contact Adam Bruce with questions. Woodland Hills Mall has a large food court. There are also several other local restaurant choices, but Woodland Hills is probably the most convenient choice. Buses should plan to pick up students in the same location as drop-off. 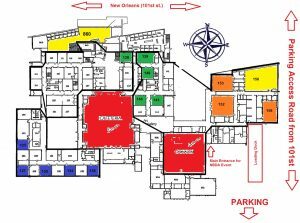 The director’s hospitality room is located in the upper floor Fine Arts Atrium and will have refreshments courtesy of the Union Band Parents Club on Friday (all day except lunch) and Saturday (breakfast meeting and until lunch). Please contact any Union Bands faculty member if you have questions. • Absence from a full morning, afternoon, or evening rehearsal session will result in the automatic termination of the participant. • The band chairman will deal with any absence or substantial tardiness after consultation with the clinician and the student’s band director. The chairman’s decision will be final. • The band chairman will also have the authority and responsibility to lower chair positions and/or remove the student from the band if his/her conduct in any way become a problem. The chairman is expected to support the clinician in matters concerning conduct. • If a student is not able to attend the clinic or concert, the director contact the district president so an alternate can be contacted. In addition, please send folder to the clinic for the other players to use. The NBDA High School honor band clinic will be held at Bartlesville High School on January 11-12, 2019. LATE ENTRIES will be accepted through January 18, 2018, with a fee of $50 per student. Due to scheduling conflicts on the BAHS campus, the audition this year has been MOVED to the Broken Arrow Freshmen Academy at 301 W. New Orleans St., Broken Arrow, OK, 74011. Special thanks to Auditions Coordinator Kyle Smith of Broken Arrow Bands. Next Monday, Aug. 27th is our annual Fall Business meeting and dinner. The meeting begins at 6:30 PM at the Union H.S. Fine Arts Atrium. Last year we had really great attendance! I hope to see you there again this year. Each person planning on attending needs to click on the link below and fill out the RSVP. (Not simply one person from each school.) We need a count by this Friday, so if at all possible, go ahead and fill out the form now if you are coming. We hope you can join us for the meal, but if that’s not your thing, please join us for the meeting. If you have new staff in your district, please do two things. (1) Send me their email address so I can add them to my distribution list, and (2) also forward this info to them directly. Please remind your students to bring pencils to all rehearsals. Music stands will be provided; no need to bring folding stands. Under the UNION HIGH SCHOOL sign is a set of glass doors that students and directors may enter. Once you have entered the building, take an immediate left to find the clinic rehearsal rooms. Students should plan to keep instrument cases at their chairs or at the back of the rehearsal room, avoiding case storage in the hallways. Students will case their instruments at the end of each rehearsal as there may be some rotating of the rehearsal spaces. All large percussion instruments will be provided (anything on wheels). All other percussion instruments, accessories, hardware, cases, etc. should be brought to the clinic/concert by the honor band percussionists, and each participating school should LABEL its own assets. For lunch there are several options; Woodland Hills Mall has a large food court . There are also several other local restaurant choices, but Woodland Hills is probably the most convenient choice. Buses should plan to pick up students in the same location that they dropped off. The director’s hospitality room will have refreshments courtesy of the Union Band Parents Club on Friday (all day except lunch) and Saturday (breakfast and for about half an hour following lunch). Please let any Union Bands faculty member know if you have any questions. A. Absence from a full morning, afternoon, or evening rehearsal session will result in the automatic termination of the participant. B. The band chairman will deal with any absence or substantial tardiness after consultation with the clinician and the student’s band director. The chairman’s decision will be final. C. The band chairman will also have the authority and responsibility to lower chair positions and/or remove the student from the band if his/her conduct in any way become a problem. The chairman is expected to support the clinician in matters concerning conduct. D. If a student is not able to attend the clinic or concert, please have your director contact the district president so an alternate can be contacted. In addition, please send your folder with your director to the clinic for the other players to use. Special thanks to Kyle Wright and his team at Sand Springs for hosting the auditions, as well as Auditions Chair Taylor Sitzman (Union) and Chief Tabulator Richard Fair (Broken Arrow).